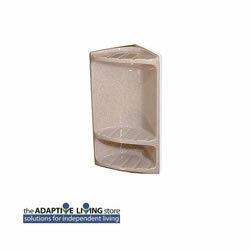 Surface Mount Triangular Corner Shower Caddy, 10" x 17" x 7" x 6"
Surface Mount Shower Caddy with Shelf for installation in Our Low Profile Shower Units. Outside Dimensions 10" x 17" x 7-1/4" x 6-3/4"
Shampoo Storage Area Dimensions approximately 9" x 10-5/8" x 5"
Soap Storage Area Dimensions approximately 9" x 3-5/8" x 5"
63% of this product is a hydrate crystal--Al2O3+3H2O. Alumina is also the main ingredient in Corian and all "solid surface" products. 37% is a special polyester resin and does not contain any urea formaldehyde. Cultured marble type molds are used to cast product. Please refer to the Color Selection Chart for your Shower Unit Color Choice or to Order FREE Samples. Please Note: Caddy & Shelf Shower Accessories are custom ordered. Once in production, the order cannot be changed, refunded, returned or exchanged. Please confirm your order with an Adaptive Living Representative. Please note: Seasonal Lead Times apply (currently) 1-2 weeks. If ordered with shower it will ship with the shower ship schedule. Please contact an Adaptive Living Store representative for current lead time. This item is delivered via Ground if purchased separately from Shower Unit.